I really really want to cut my hair but everyone's telling me not to. So okay, I decided I'll let it grow again. And then I saw this retro video of "Blue Kiss." I so love this song! And I so love Jane Wiedlin's short crop! I also love the rabbit on the album cover! Anyway, Jane's hair reminds me of Winona Ryder's cut, too. Gosh, I loved Winona. Especially in 1990's Edward Scissorhands. Or maybe I loved Johnny Depp there. Nicole Delos Angeles, Beauty Editor of Cosmopolitan, told me short hair is a lot more work because I'll have to style it to death with mousse, gels, waxes, etc. Plus, I'll have to wear makeup and earrings so I won't look like a boy. Gee, I never realized short hair was so high maintenance! Oh well, it's just hair. If I look terrible, it'll grow back. Trouble is no one wants me to cut my hair short. Especially Vince. When I showed him that wigged pic, he totally looked at me with horror. I think he won't make love to me if I cut my hair short! Then again, I don't think my husband can resist me tee hee. 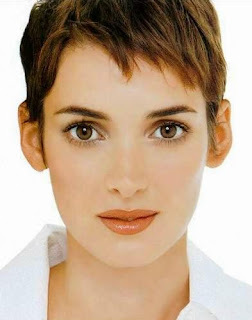 In the 90's I had the exact same hair cut like Winona Ryder! Same colour and everything. I used to wear smoky eyes to go with it plus a basic black wardrobe (went with the job). I adored that hairstyle! Now that I'm in my 30's I feel I need longer hair to frame my face, make me look softer somehow. Besides, it's always so cold over here that I need my hair to cover my ears! Not only is short hair high maintenance, you need to keep your skin/face in mint condition too. And should you have slept in the 'wrong' position, the short hair will stick up in the back. hahaha! ps - it takes AGES to grow back! I had a pixie for a LONG time (http://wbjewelry.blogspot.com/2008/09/been-there-done-that.html) ...grew it out, then went back to it at a time when I was in denial about having gained ten pounds. I wasn't in denial anymore after unmasking my chubby cheeks! I cried for a day! LOL. I'm sure you don't have the cheek issue though. I chopped off all my hair just over a year ago - loved it for a while but then I really missed my long hair - but like you said it growns back and you can wear wigs! lol. i dont really like short hair myself. I feel the shape of my head doesnt really support it, but i love it on people who look nice with it. Duni, yikes, I can't do smoky eyes! Do those come with short hair, too? I'm not scared to grow my hair back, though. My hair grows really fast--like an inch a month. That's why my stylist doesn't want to do it. He said, "For it to look great, you'll have to get a trim every two weeks!" 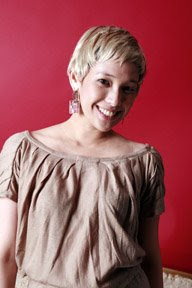 WendyB, so I am correct--pixie cuts really are just for super thin people! Oh dear, so I have to have smoky eyes, a black wardrobe, perfect skin, and be 20 lbs underweight??? Bucca, ya, hooray for wigs! Jori, you're so funny. I need to look older actually. I'm 32. Everyone says I look 22. African Diva, I'm nowhere near how Sinead O'Connor looks like and I have huge ears but, hey, it's just hair. Right? Looks like it's more than just hair, though. It's skin, makeup, wardrobe, the works! Lei, after all I've read above, maybe short hair isn't liberating. Looks like more time in front of the bathroom! You are worrying about hair length? I am thinking where my hair went and how to get them back! Enjoy your blessings.